We received admission to the locations below for the purpose of review, but all opinions are our own. I love history. In fact, when we visit a new place, the history of the area is one of the first things I will look into, to find fun ways that we can incorporate that learning into our time there. Luckily, Charlottesville, VA. is teaming with history. Two United States Presidents had homes located here, with a third just 30 minutes outside of town. There is also a historic downtown area, as well as a mostly original tavern from the 1800's, which has been meticulously preserved and is still open for tours and dining today. With this wealth of history for families to explore, Charlottesville, VA. is both an educational and fun vacation destination. Start your day of historic fun in Charlottesville, VA. with a trip to Monticello, the beloved home of Thomas Jefferson, our nation's third president. In his lifetime, Thomas Jefferson held just about every position in politics that one could possibly hold at the time. He drafted the Declaration of Independence at the age of 33, served as governor of Virginia, Vice President, President, Secretary of State, trade commisioner and more. Always looking to serve his country, one of his last contributions was the development of the University of Virginia at the age of 76. His dedication and attention to detail is no less apparent in the design and creation of Monticello, his beloved home, which was designed and redesigned almost constantly for 40 years. It was here that he enjoyed 10 years of happiness with his wife Martha until her death, and that he always longed for, not matter where his service to his country may have taken him. Nestled amongst lush gardens high atop a hill, when you visit, you can stand at the edge of the garden and picture it as it was with Thomas Jefferson looking over his land with approval. Tours of the home are available with admission to Monticello. Both regular and family tours can be booked throughout the day. Watch a short film of Thomas Jefferson's life, stop with your kids in the Griffin Discovery Room and then walk or ride the shuttle to the top of the hill where you will find Monticello. The gardens and cellar area of the home are open for self touring, but a scheduled tour is needed for the inside of the home, and no photography is allowed once inside. Hours vary throughout the year, so check the calendar for your dates. Admission is $25 for adults, $16 for ages 12-18. and $8 ages 5-11. Just a few short miles from Monticello, you'll find Michie Tavern, a perfect place to stop for food and fun on your day full of history with your family. Officially opened as a tavern in 1784 by William Michie, Michie Tavern was originally located 17 miles away on a busy stage coach route. William Michie died in 1811, but the tavern was in operation until 1850 when it became used solely as the Michie home until it was sold to the Via family in 1910. Threatening to become destroyed due to disuse, a local woman Mrs. Mark Henderson purchased the tavern and moved it to its current location where it has been in operation since. Take a tour with the family to learn what a traveler might have encountered at the tavern in colonial times, enjoy a meal with what I believe to be some of the best fried chicken I have ever had, enjoy colonial style games in the afternoon, and browse the general store and toys shops for one-of-a-kind gift ideas. Hours vary at Michie Tavern throughout the year, so check the Michie Tavern website for details. Tours are $6 for adults and $2 for children ages 6-11. The buffet costs $17.50 for adults, $10.95 for ages 12-15, and $6.95 ages 6-11, plus you get a discount on adult tour tickets with the purchase of lunch. Unlike Thomas Jefferson's home at Monticello, James Monroe's home at Ash Lawn-Highland stands in stark contrast. Never a full-time home meant for retirement like Monticello, James Monroe purchased the property mainly for plantation and investment purposes. The original small home is the white portion that you see in the photos, and the addition of the Victorian-style wing came in the 1880's. James Monroe was the fifth president of the United States, and a close friend of Thomas Jefferson. In fact, Jefferson had a great influence on how James Monroe designed the layout, placement and development of his home and plantation. Tours are carried out throughout the day, and cover the life and home of James Monroe. Many of the pieces found within the home are original, and there are rotating exhibits within the Victorian wing of the home as well. When visiting, take some time to tour the grounds, including the original and recontstructed slave quarters and the farmyard complete with some farm animals. Admission is $14 for adults and $8 for children ages 6-11. 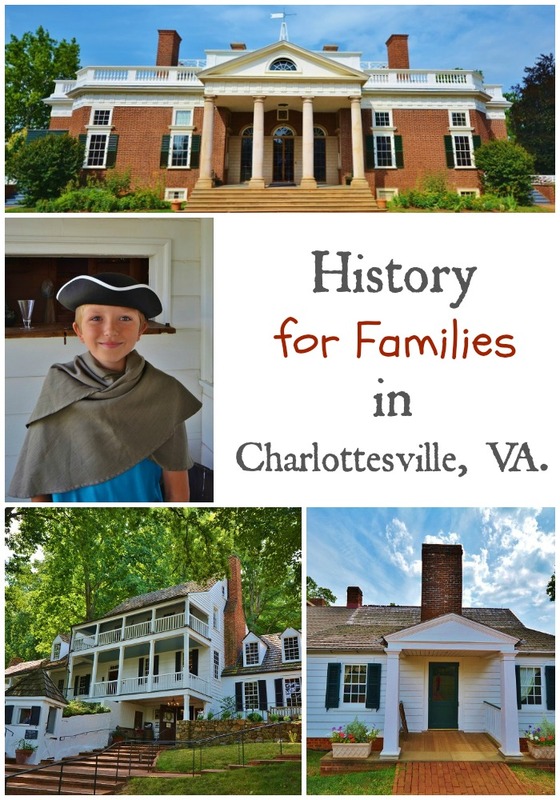 Planning a visit to Charlottesville and want to take in all three of these historic sites with your family? The Monticello Neighborhood Pass is a great way to save some money. This pass includes admission to all three locations for a price of $40 for adults March 15-October and $32 from November-March 14th. Children passes run $18 for ages 5-11 throughout the year. When we visited Charlottesville, I was honestly concerned with how the boys would react to a day full of history tours, but they really became involved and enjoyed every minute of it. If you are visiting Charlottesville with your family and want more information on any of these locations or others in the area, check out VisitCharlotttesville.org. How exciting is that! I love history as well, so this would be totally up my alley. I've never been to Virginia but I've always wanted to! These all look like such fun activities! Oh wow Monticello is gorgeous (as are your photos), I would love to visit one day. That season pass sounds like a great deal too. Your pictures are so vivid. It's like I'm right there with you. I'd love to visit an old time general store. It sounds like an interesting place to visit! Monticello looks lovely! SO neat. I would love to take my girls up there. I have never been to that area - I would love to experience it together. Very nice pix. Thank you for sharing. I love wild west history and so do my kids. My husband is more of the eastern history buff, but this has me interested. Awesome! My wife and I and our two kids will be doing this trip in a couple of weeks. I have been a Jefferson junkie for some time now and will finally get a chance to visit his home. We are timing with their Heritage Harvest Festival with stresses Jefferson's love of gardening and general agrarianism. Reading this post has gotten me even more excited! Those pictures are stunning! I would love to visit all of those locations! Is Michie Tavern skippable? After visiting two presidential homes, I believe a tour of Michie Tavern offer a fresh insight into the life of the common man. There is no charge to enjoy the grounds or shops. The tour is self-guided and a docent is available to answer questions. Children may dress in colonial garb and play colonial games. The Tavern's Midday Fare is patterned after the 18th century when the main meal of the day was served in the afternoon. If one prefers lighter fare, Ash Lawn-Highland, Monticello, Carter Mountain Orchard and a quaint little store called Salt offer food --- all of which is very tasty. The places are really awesome & the history behind them is also interesting.